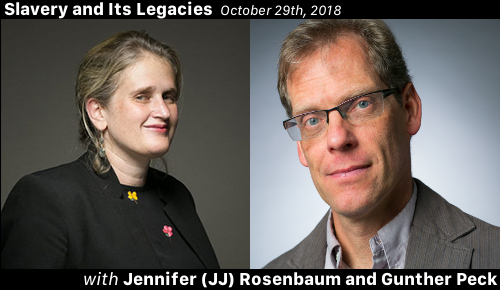 Thomas Thurston is joined in conversation with Jennifer (JJ) Rosenbaum and Gunther Peck as they discuss the connections between labor and human trafficking. Jennifer (JJ) Rosenbaum is the U.S. director for Global Labor Justice (GLJ), a new strategy hub supporting transnational collaboration among worker and migrant organizations to expand labor rights and new forms of bargaining on global value chains and international labor migration corridors. Rosenbaum has litigated cases before trial and appellate courts, lead national policy campaigns, and testified before the United States Congress on labor issues of migrant workers and previously was the founding legal and policy director for the New Orleans Workers’ Center for Racial Justice and the National Guestworker Alliance. She is a member of the Modern Day Slavery Working Group, Yale University, Gilda Lehrman Center for the for the Study of Slavery, Resistance and Abolition and held a Robina Fellowship at the Orville H. Schell. Jr. Center for International Human Rights with a focus on the intersection of global value chains and labor migration. She co-chairs the American Bar Association’s Immigration and Human Trafficking Committee and lectures on labor migration at Harvard Law School. Gunther Peck is an Associate Professor History and the Director of the Hart Leadership Program at the Sanford School of Public Policy at Duke University, where he teaches undergraduate and graduate courses in ethics, immigration history, environmental history, and abolitionism, past to present. His first book, based on his dissertation at Yale University, was entitled Reinventing Free Labor: Padrones and Immigrant Workers in the North American West, 1880-1930, and won the Taft prize for best book in North American Labor History, the Billington Prize for the best book in frontier history, and the Pacific Coast Award for best book in comparative North American history in 2001. He is writing two books on the intertwined histories of race, human trafficking, and abolition. The first “Race Traffic: Historicizing the Global Origins of Whiteness, 1660-1860” will be published by the Omohundro Institute and the University of North Carolina Press in 2019. An article from the second book project “The Shadow of White Slavery: Race, Innocence, and History in the Contemporary War on Human Trafficking,” was recently published as an essay in a volume called The Uses of History in Foreign Policy Making, edited by Hal Brands and Jeremy Suri. Professor Peck is an active citizen in Durham, NC where he lives with his wife Faulkner Fox and with whom he has three children.